So yesterday I introduced you to our guest bathroom. I showed you how I framed in the builder basic bathroom mirror with some simple trim pieces. But I wasn’t even halfway done! Remember this was after I had been reading Home/DIY blogs for a while and I was in love with the wainscoting I was seeing. I thought that board and batten treatment would be perfect for this bathroom. Once again, this was before I was writing a blog so I don’t have in-process pictures but I can sort of walk you through what I did. And here is the after! Basically I used a 1×3 board and leveled it straight up against the wall as the “chair rail”. It is higher than chair rail height though – probably up about 2/3 of the wall. I then put a 1×3 on top of that one to make the ledge. I secured these with these nails and some liquid nails. That is the “board” part of the board and batten. For the “batten” part I used 8 foot lattice strips that cost under $1.00 at Home Depot or Lowe’s. I just cut them to size, spaced them out evenly on the walls, and adhered them to the wall with liquid nails. So the wall in between the “battens” I just painted white with my white trim paint. I also painted out the board and batten pieces white as well. So once you are done it looks seamless. Here’s another before and after wall. After! 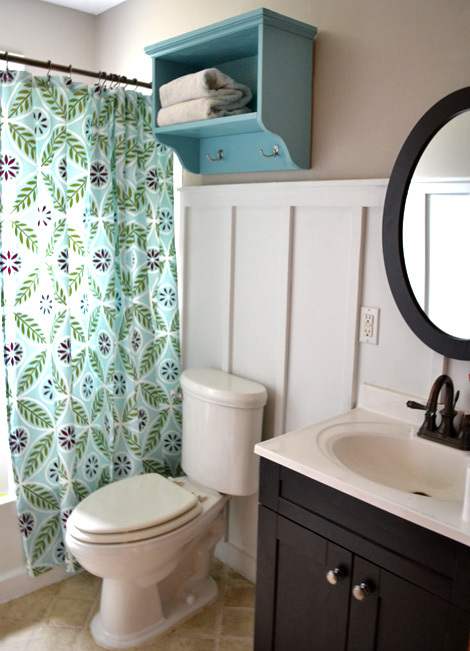 I did the board and batten treatment in the whole bathroom – on all the walls. Here’s the wall in between the sink and the shower. I love the little ledge that it created for me to decorate! Another simple update that made BIG impact! And one more before/after for you. And because I know this isn’t a good step-by-step tutorial here are some good tutorials I found as well as some different ways you can do board and batten. Board and Batten without a ledge and with added hooks for hanging book bags or coats from here. And I love this double box version of Board and Batten too that Thrifty Décor Chick did. She used MDF strips which is what I will use if I do any more board and batten in our house. Her tutorial is here and the finished room is here. Hope that gives you some more ideas of what it can look like in other rooms and in different styles. And I still wasn’t done in our bathroom! Come back tomorrow to see another project I did in our guest bathroom. This is looking so good! I love the nautical theme. This looks great! Just wondering if you have smooth or textured walls? I have textured walls in our bathroom, and wanted to know if just painting them and the board and batten is enough to still make it look good….